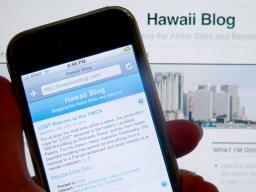 If you’ve got an Apple iPhone or an iPod Touch, you can now browse Hawaii Blog with ease. Thanks to the iWPhone WordPress Plugin, this site now looks especially slick and clean for users of these devices… but looks exactly the same for everyone else. Yes, I realize the ridiculousness of creating a special version of a website for a gadget that prides itself on being able to show you the “whole internet,” but as a satisfied iPhone user (who stood in line on June 29 and didn’t even whine when the price dropped $200 two months later), I can attest to the usefulness of a seamless interface with larger-than-microscopic links and other elements. Don’t have an iPhone but want to see what iPhone users see? There’s always the iPhoney application from Marketcircle. Don’t have a Mac? Can’t help you, buddy. I can’t wait to try it when I get another iPod Touch. I had to send my first one back to Apple due to too many stuck pixels. I’m sure they’ll get those kinds of issues worked out eventually. It was a really cool device and I miss it already. It’s pretty neat how sites like yours are catering to the iPod Touch/iPhone screens. Next story No Rock for You!